FlyView Paris : Come and visit Paris in virtual reality! Come visit Paris in virtual reality! 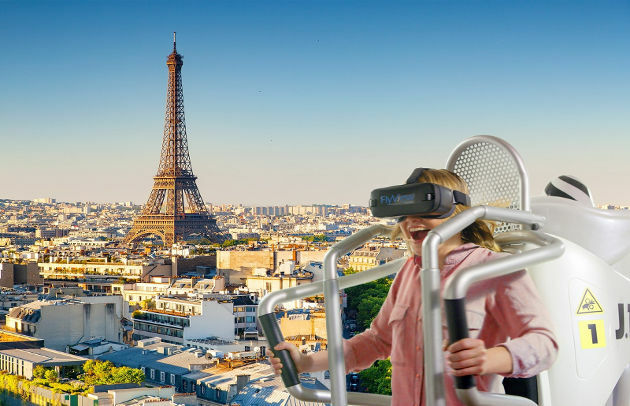 The hotel Raspail Montparnasse presents to you FlyView Paris, a breathtaking attraction that allows you to fly over Paris … In virtual reality! Discover the city like you’ve never seen it before. FlyView, an experience to try ASAP! Since March 31th, 2018, you can “fly over” Paris in virtual reality, aboard a jetpack, a flight simulator. to fly over the “City of Lights”. The project, which involved more than a hundred people, is a realization that required a shoot over Paris with a drone and 7 cameras, to make the experience ever more realistic! The quality of the images combined with the movements of the platform simulating the motion of the jetpack really give you the feeling to be flying over Paris! The Great Wall of China, Victoria Falls, Angel Falls, Lake Baikal, Rajat Ampat Archipelago and Mont Blanc. Book your FlyView flight, and visit Paris in virtual reality! The 800 square meters takeoff area is impressive and almost surreal with its fifty jetpacks! It is also one of the greatest virtual reality achievements in the world. It is now time to put down your bag and buckle up. Then comes the countdown before take-off. The turbine starts, the lights go down, the jet starts to vibrate and then rises. You can then see the roof opening, and right now, even before you start, you forget the virtual reality headset! You fly over Paris, its roofs, its squares, its gardens, its monuments. You can even feel the wind caressing your hair while you slalom between the gargoyles of Notre Dame de Paris. The immersion is total, it really is incredible! So, want to visit Paris in virtual reality? Monday to Thursday from 11am to pm. Friday, Saturday from 11am to 9pm. Sunday from 11am to 9pm. Come and celebrate New Year’s Eve in Paris!